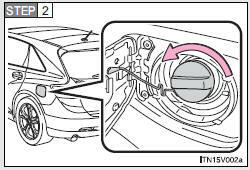 Perform the following steps to open the fuel tank cap. 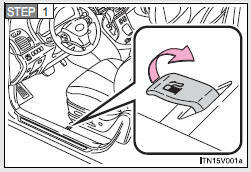 • Vehicles with smart key system Turn the “ENGINE START STOP” switch off and ensure that all the doors and windows are closed. • Vehicles without smart key system Turn the engine switch to the “LOCK” position and ensure that all the doors and windows are closed. • Confirm the type of fuel. 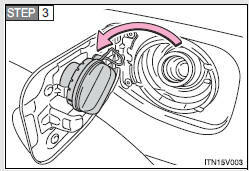 When replacing the fuel tank cap, turn it until a clicking sound is heard. After releasing your hand, the cap will turn slightly to the opposite direction. Observe the following precautions while refueling the vehicle. Failure to do so, may result in death or serious injury. • Touch the vehicle or some other metal surface to discharge any static electricity. Sparks resulting from discharging static electricity may cause the fuel vapors to ignite. 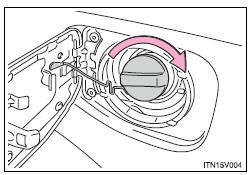 • Always hold the grips on the fuel tank cap and turn it slowly to remove it. Wait until the sound cannot be heard before fully removing the cap. In hot weather, pressurized fuel may spray out the filler neck and cause injury. • Do not allow anyone that has not discharged static electricity from their bodies to come close to an open fuel tank. • Do not inhale vaporized fuel. • Do not smoke while refueling the vehicle. • Do not return to the vehicle or touch any person or object that is statically charged. Doing so may damage the vehicle, such as causing the exhaust systems to operate abnormally or damaging fuel system components or the vehicle’s painted surface.